YOU'RE READING This marriage proposal is the cutest ever – and it includes fluffy pups! Maurice Goldstein and Laura Stampler. (Photo: Twitter/@@laurastampler). Maurice Goldstein, 31, proposed to Laura Stampler, 30, who’s a freelance journalist and author, during a trip to Los Angeles for Thanksgiving, Honey Nine report. Maurice hired Laura’s best friend, Rebecca Yale, to photograph and film the epic proposal. In an adorable video posted by the bride-to-be on Facebook, the couple, who are from New York City, can be seen walking to the top of a hill at Runyon Canyon in the Hollywood Hills, with Lauren seemingly catching onto what was about to happen when she spotted rose petals. When the in love pair got to the top of the hill, a group of acapella singers sang the journalist’s favourite Disney songs, which brought her to tears. Maurice then got down on one knee and popped the big question. “He said ‘From the first day I met you,’ and then I completely blacked out. “He kind of blacked out too. It’s like all a sudden this was happening, and I was kissing him,” she said. 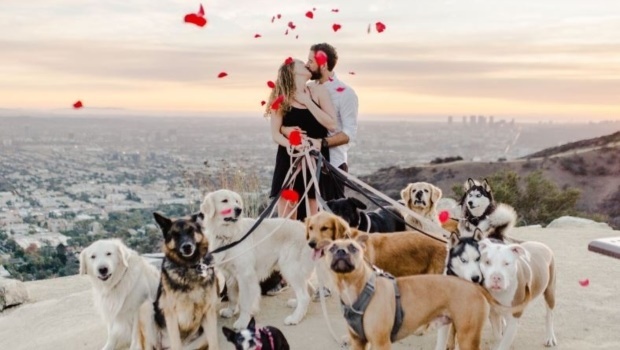 After Laura, who loves dogs, said yes 16 adorable pups of different breeds ran towards the newly engaged couple. “Releasing dogs is so much better than releasing doves,” Laura said. The couple hope to get married next year in Los Angeles, where both of their families reside, Daily Mail reports.